FMS’s curriculum for the 2s is designed to introduce children to school gradually. It offers a loving and nurturing environment where children learn to build relationships with their peers and develop community-based routines as well as individual ones. Children will learn to become independent, use their five senses, explore their creativity and imagination through arts and crafts projects, and will develop their gross and fine motor skills through various age-appropriate activities. Great emphasis will be given to socialization, cooperation, and development of language. Children can attend 2, 3 or 5 days per week from 9am to 3pm with the aftercare and lunch options. Class size is 8 children and ratio is 1:4. The curriculum for the 3s offers formal and structured activities for developing pre-reading and pre-writing skills: promotion of phonological and phonemic awareness and building of alphabetic skills including letter identification. Calligraphy and pre-writing are also introduced, specifically with the writing of the first name. Curriculum for this age group includes plenty of arts and crafts projects as well as an introduction to music through discovery of instruments, songs and musical masterpiece listening and learning. Students can attend on a two, three or five-day-per week basis from 9am to 3pm with the aftercare and lunch options. Class size is 13-16 students and ratio is 1:7-8. 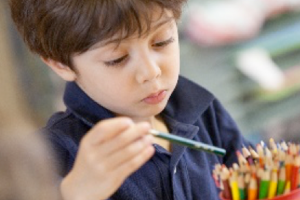 The curriculum prepares 4s for more formal and structured activities in view of entry into Kindergarten. The program emphasizes the development of literacy and focuses on correspondence letter/sound correspondance, letter shaping and forming syllables, word recognition. Math concepts are also introduced with numbers and quantity, sequencing and patterning, shapes recognition and problem solving. The curriculum also offers plenty of collective and individual art projects, a lending library and an introduction to music, some music theory and instrumental practice. In Moyenne Section students attend five days per week and have the option of aftercare and lunch. Class size is 13-16 students and ratio is 1:7-8. 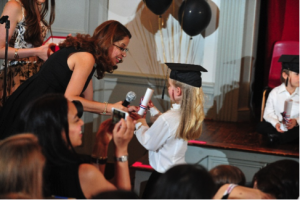 The last year of the Maternelle, La Grande Section, is the graduating year and is an important transition between the preschool years and the elementary years. 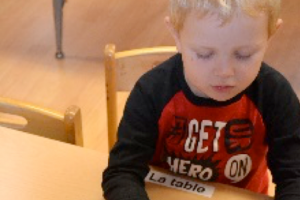 It offers the tools for a successful First grade and more specifically targets literacy, speaking fluently in French, math reasoning and music practice. Focus is on written and oral language structure, time and space concepts, adding and subtracting, independence and perseverance in work and learning habits. Music and instrumental practice are included in the curriculum as a way to support learning of the arts and individual creativity. The teaching of core virtues takes all of its dimension and students are expected to demonstrate a specific set of moral and intellectual values. All aspects of the Primary Skills as described in the curriculum should be achieved by the end of the Grande Section. Students typically attend five days per week. Class size is 8-12 students and ratio is 1:4-6.